St Petersburg sports fan are obsessed with the following teams: Zenit, Ska, Dinamo, and Spartak. What about you? Nowadays sports contribute as much to St Peterbsurg’s local culture as do our world-famous museums and palaces, concert halls, and universities. From soccer to ice hockey, and basketball to water polo, or tennis and volleyball, Saint Petersburg has as much to offer as other Western countries when it comes to sport. Things work the same as anywhere in the world, though there is still a slight distinction in how sports events are being handled in Russia. For example, did you know that Russia is one of the world's premier figure skater factories and Saint Petersburg has produced many of the country's top skaters. Or, do you know that football is Russian’s favorite sport? I bet you didn't know that! You can experience the action and excitement of St Petersburg sports and meet with Russian fans in different places. And, I can assure you that it would be safe and worth going regardless of what sport you like. Ready to go? If so, see below our top list of St Petersburg sports venues, and choose where to go. The Nevskaya Volna Water Sports Centre not only caters for swimming and water sports but also stages some fabulous shows on water. The centre houses two professional sized pools, one for swimming (54M x 25M) with seating for up to 1000 spectators. The other is for water polo, synchronized swimming and diving and although a smaller pool, the seating accommodates 1500 spectators. A sports school operates from the venue and regular competitions are hosted here. Housing over 8,000 seats the Yubileiny Sports Palace is a stadium mainly used for ice hockey and basketball and the ice rink is a prominent training centre for figure skating. The venue is multipurpose and hosts rock and pop concerts, and international sports events as well as corporate events and conferences. The St Petersburg Stadium, located on the former site of the Kirov Stadium is now variously referred to as Zenit Arena, Krestovsky Stadium and Piter Arena, and has a capacity of over 56,000 people. It is located on the western tip of Krestovsky Island. Although it’s quite a walk from the Metro station, the area is dotted with cafes, restaurants, and bars. The stadium was opened in 2017 and is the stadium where the 2018 Football World Cup is held. Not only does the stadium have a retractable roof, but also a retractable pitch, allowing non-football activities to be held on a solid surface. Definitely a must-see! Petrovsky Stadium is located on Petrovsky Island and today the Tosno team plays many of its home games of football here. The stadium was the former home stadium of Zenit football team, and also hosted the Goodwill Games in 1994. It seats over 21,000 patrons. The complex has two arenas, the second being the MSA or Minor Sport Arena. Entertainment, music concerts, and festivals are also held here. A few cafes are nearby although the city centre offers more options. The 5-storey Ice Palace opened in 2000 and is an arena that seats over 12,000 patrons, making it the largest and most modern sport and concert venue in the city. 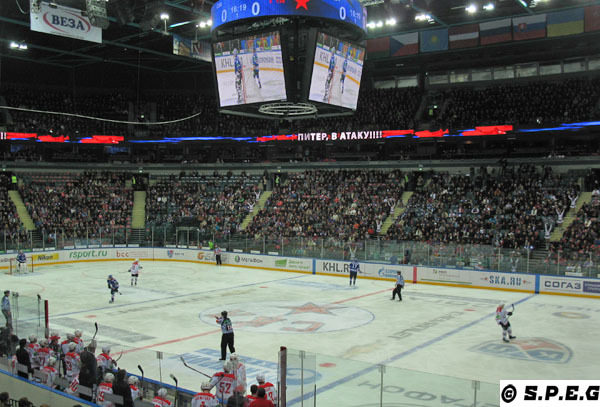 Primarily it’s used for ice hockey and is the home arena for the city’s top ice hockey team, SKA. This is the place to visit to see an enthralling game of ice hockey, or when it’s not being used for hockey it’s used for exhibitions, concerts, and as a skating rink (winter only). Several cafes are on the first floor. We've been here a couples of time and it is an interesting fun place to go. The easier way to buy tickets for any of the St Petersburg sports events is on-line through their official website or via the following sites: www.bileter.ru or www.spb.kassir.ru. Alternatively, you can purchase tickets at the official shop of the sport teams like Zenit and SKA if you're going to watch them, which you can find on the famous Nevsky Prospekt in front of Gostiny Dvor. If you go, remember to bring your passport, and to print the tickets out regardless of which St Petersburg sports you go to see.